The C Bounded Model Checker (CBMC), which helps to detect bugs in software, won the ‘Falsifcation’ category in the TACAS 2017 6th International Competition on Software Verification (SV-COMP’17). The results of the competition were announced at the European Joint Conferences on Theory and Practice of software (ETAPS) in Uppsala, Sweden on 27 April. The focus of SV COMP’17 was precision and during the competition, CBMC did not give a single wrong answer in its category. Dr Tautschnig co-developed CBMC with Professor Daniel Kroening from Oxford University and Peter Schrammel from Sussex University. 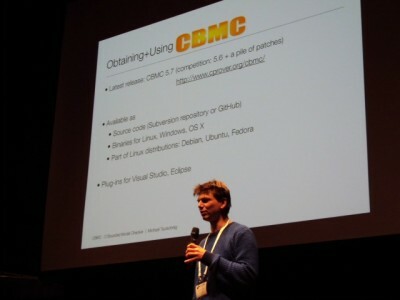 It is available as open source from GitHub and, notably, several further contestants in SV-COMP’17 used CBMC as part of their submission. The competition is aimed at providing a snapshot of the state-of-the-art in software verification as a means to compare, independently from particular paper projects and specific techniques, different verification tools in terms of precision and performance. TACAS also helps increase the visibility and credits that tool developers receive. It assists to provide a forum for presentation of tools and discussion of the latest technologies and to give students the opportunity to publish about the development work that they have done.